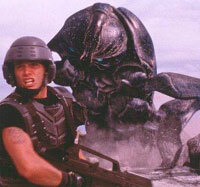 Sony has announced the arrival date for their Direct to DVD Starship Troopers sequel. Expect Starship Troopers 3: Marauder on store shelves July 29th. That’ll put it up against another major science fiction release: Stargate Continuum. For this second DTV sequel Casper Van Dien returns as Johnny Rico. The plot, presumably, revolves around futuristic soldiers fighting alien bugs. I wonder if it bothers them to be called bugs? What Starship Troopers really needs though isn’t Casper Van Dien. They need to invest in bringing back Neil Patrick Harris. If NPH can make Harold & Kumar good, just imagine what he could do returning to the world of Starship Troopers. What would NPH do? Make anything he’s in awesome. Also he’d kill bugs with his crazy mind bullets. Movies that capitalize on a name and then piss all over the story piss me off. I agree with you there Troubleshooter. They really should have left this one alone. The book, a teen book by the standards of the times, is an interesting and creative look at the responsibilities of citizenship and individuals. I wouldn’t be surprised to see it needing a permission slip from parents to be read in school today. The book and the movie are two almost entirely things. I enjoy certain aspects of Veerhoeven’s film, but it’s really barely even an adaptation. It would be nice if someone would do a real adaptation of Heinlein’s book at some point, instead engaging in these useless sequels to Veerhoeven’s movie.